and where all walks of life come together. Main Street's businesses reflect the uniqueness of a town's history and people. The character of Main Street contributes to the community's sense of place. In the last fifty years, many Main Streets have been straightened and widened in an effort to speed traffic through town. Regrettably, this "faster is better" philosophy has made many Main Streets dangerous for pedestrians and bicyclists and has discouraged street life and economic activity. 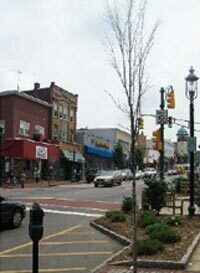 NJFIT wants to revitalize Main Street by looking beyond speed and considering the travel convenience, safety, economic and social benefits that can be achieved by a better, more balanced and lively Main Street. Main Streets provide a concentration of businesses, allowing people to complete several errands in one trip. A walkable downtown reduces the need to get in your car to make longer and more frequent trips to distant malls and grocery stores. Main Streets with sidewalks and bike lanes experience an increase in the number of people walking or biking and a decrease in automobile travel, congestion and air pollution downtown. More importantly, pedestrian and bicycle-friendly streets create opportunities for people to meet and interact, therefore creating community networks. A lively Main Street benefits everyone. Communities that invest in better walking conditions tend to experience an increase in retail sales and property values. They are also more inclusive of people who cannot or do not wish to drive. The elderly, children and people who cannot afford a car can take part in community activities, job opportunities and shopping on Main Street. Stores and businesses are also attracted to a lively Main Street and will even pay extra to be in a vibrant and dynamic downtown. NJFIT redesigns and reinvests in Main Streets, helping local entrepreneurs and communities alike regain their centers. identity and balance. Lively Main Street FITness goal is listed below in the drop down boxes. Achieving this goal is possible through the application of various tools and programs.